1. What are nucleic acids? What is the historical origin of their name? DNA and RNA, the nucleic acids, are the molecules responsible for the hereditary information that controls the protein synthesis in living organisms. The name “nucleic” derives from the fact that they were discovered (by the Swiss biochemist Friedrich Miescher, in 1869) within the cell nucleus. At that time, it was not known that those substances contained hereditary information. 2. What units make up nucleic acids? What are the chemical compounds that make up those units? Nucleic acids are formed by sequences of nucleotides. Nucleotides are composed of one molecule of sugar (deoxyribose in DNA and ribose in RNA) bound to one molecule of phosphate and to one nitrogenous base (adenine, uracil, cytosine or guanine, in RNA; and adenine, thymine, cytosine and guanine, in DNA). 3. What are pentoses? To what organic group do pentoses belong? Are nucleotides formed of only one type of pentose? Pentoses are carbohydrates made of five carbons. Deoxyribose is the pentose that composes DNA nucleotides and ribose is the pentose contained in RNA nucleotides. 4. Into which two groups can the nitrogenous bases that form DNA and RNA be classified? What is the criterion used in that classification? The nitrogenous bases that form DNA and RNA are classified as pyrimidine and purine bases. Through the analysis of the structural formulae of those nitrogenous bases, it is possible to see that three of them, cytosine, thymine and uracil, have only one nitrogenized carbon ring. The others, adenine and guanine, have two nitrogenized bound carbon rings. 5. What is the difference between DNA and RNA from the point of view of the nitrogenous bases that are present in their nucleotides? In DNA, nucleotides can be made up of adenine (A), thymine (T), cytosine (C) or guanine (G). In RNA, nucleotides can also contain adenine (A), cytosine (C) or guanine (G); however, instead of thymine (T), they contain uracil (U). 6. What parts of nucleotides bind to form nucleic acids? What is meant by the 5’ and 3’ extremities of nucleic acids? The phosphate group of one nucleotide binds to the pentose of the other nucleotide and so on to make the polynucleotide chain. Each extremity of a DNA or RNA chain can be distinguished from the other extremity by its terminal chemical entity. The phosphate-ended extremity is called a 5’-extremity and the pentose-ended extremity is called a 3’-extremity. Therefore, DNA or RNA chains can have a 5’-3’ or 3’-5’ direction. These directions are important for several biological functions of DNA and RNA, since some reactions specifically occur in one direction or the other. 7. Bacteria are prokaryotic cells, meaning that they do not have a membrane-enclosed nucleus. Eukaryotes have cells with am enclosed nucleus. Where in these types of cells can DNA be found? In eukaryotic cells, DNA is found within the cell nucleus. In prokaryotic cells, DNA is found dispersed in the cytosol, the fluid space inside the cell. Other DNA molecules can also be found within mitochondria and chloroplasts, specialized organelles of eukaryotic cells. 8. Who were James Watson, Francis Crick and Maurice Wilkins? Watson (American), Crick (British) and Wilkins (New Zealander) were responsible for the discovery of the molecular structure of DNA, the double helix made of two polynucleotide chains paired by their nitrogenous bases. They won the Nobel Prize in medicine in 1962 for the discovery. 9. According to the Watson-Crick model, how many polynucleotide chains does a DNA molecule have? A DNA molecule is formed by two polynucleotide chains bound in antiparallel mode (5’-3’ to 3’-5’) and which form a helix structure. 10. What is the rule for the pairing of nitrogenous bases within the DNA molecule? What about in RNA molecules? Is this last question relevant? The rule for the pairing of the nitrogenous bases of the polynucleotide chains that form DNA molecules is that pyrimidine base binds to purine base, under the condition that thymine (T) binds to adenine (A) and cytosine (C) binds to guanine (G). In RNA, there is no binding between nitrogenous bases. That is because RNA is formed of only one polynucleotide chain, as opposed by DNA, which is formed of two chains. It is therefore not correct to ask questions about base pairing in RNA. 11. What is the numeric relationship between pyrimidine and purine bases in DNA molecules? Is this valid for RNA molecules? DNA molecules are made of two bound polynucleotide chains that form a helix structure (the double helix). The binding of the two chains occurs between their nitrogenous bases and always obeys the following rules: adenine (A), a purine base, binds with thymine (T), a pyrimidine base; and guanine (G), a purine base, binds to cytosine (C), a pyrimidine base. Therefore, in one molecule of DNA, there will be the same number of adenine (A) and thymine (T) bases and same number of cytosine (C) and guanine (G) bases. As a result, the quantities of purine and pyrimidine bases will also be the same, with a 50% proportion for each type. The rule A = T and C = G, or A/T = C/G = 1, is called Chargaff’s Rule, along with the pairing rules described above. In RNA there is only one nucleotide chain. RNA is a simple chain molecule and, as result, there is no need for the proportions of the nitrogenous bases that compose it. 12. Which type of chemical bond maintains the pairing of each chain in the DNA molecule? To form the DNA molecule, purine bases bind to pyrimidine bases via intermolecular bonds called hydrogen bonds. Hydrogen bonds occur when there is a hydrogen atom near one of the following electronegative elements: fluorine, oxygen or nitrogen. In such conditions, hydrogen appears to have lost electrons to those elements and a very strong polarization is created. The highly positive hydrogen atom attracts pairs of electrons from other molecules, making a hydrogen bond. 13. What is the complementary sequence of nitrogenous bases for an AGCCGTTAAC fragment of a DNA chain? 14. What is the name of the DNA duplication process? What is the main enzyme that is involved in it? The process of copying, or duplication, of DNA molecules is called replication. The enzyme involved in the formation of a new DNA chain is DNA polymerase. There are also other important enzymes in the replication process, such as helicase, gyrase and ligase. 15. Why is the statement that DNA self-replicates incorrect? DNA is not completely autonomous in its replication process because the replication does not occur without enzymatic activity. Therefore, it is not entirely correct to claim that DNA self-replicates. 16. How do the two complementary nucleotide chains of DNA facilitate the replication process of the molecule? The fact that the DNA molecule is made of two polynucleotide chains whose nitrogenous bases form hydrogen bonds facilitates the replication of the molecule. 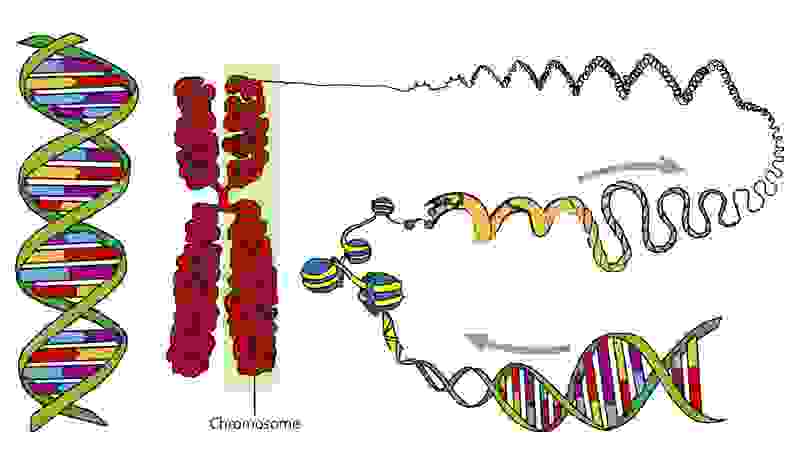 During DNA replication, the bond between the two chains is broken and each of them serves as a template for the formation of a new nucleotide sequence along it, with the help of the enzyme DNA polymerase and obeying the pairing rule A-T, C-G. At the end of the process, two double helices of DNA are produced, each made of an original template chain and of a new synthesized polynucleotide chain. 17. Which chemical bonds in DNA molecules must be broken for replication to occur? During the DNA replication process, the hydrogen bonds between the nitrogenous bases of the polynucleotide chains are broken. 18. As a result of DNA replication, two DNA molecules come into existence. Why is it not correct to claim that two “new” DNA molecules are created? What is the name given to this? During replication, each chain of the DNA molecule acts by pairing new nucleotides and, after the process, two newly formed chains made from the bond between these nucleotides appear. As a result, two DNA molecules are created, each with one chain from the original molecule and one new chain formed by new nucleotides. Therefore, it is not entirely correct to claim that the replication produces two new molecules of DNA. It is better to state that two new half-molecules are created. Because of this phenomenon, DNA replication is called semiconservative replication. 19. Does DNA replication occur during cell division? Yes. DNA replication occurs during mitosis as well during meiosis. 20. One characteristic of DNA molecules is their replication capability. What are the consequences of failures during DNA replication? Ideally, a DNA molecule should replicate perfectly. However, sometimes failures in the replication occur, causing the alteration (deletion, addition or substitution) of one or more nucleotides in the molecule. These mistakes, or mutations, also make changes in the protein synthesis process. For example, the production of an important protein for cells or tissues may be suppressed; new useful or unusable proteins may be created, etc. Mistakes in DNA replication and the resulting creation of altered genetic material are some of the main creative forces behind biological evolution and the diversity of species. 21. Mistakes can happen during every copying process, and the same is true for DNA replication. Do cells have correction systems to fix those mistakes? When are these mistakes carried only by the individual within which the mistake occurred and when are they passed on to other individuals? Cells are equipped with an enzymatic system that tries to fix mistakes in the DNA replication process. However, this system is not completely efficient. DNA replication mistakes remain within the original individual in which the failure occurred when the phenomena affect somatic cells. If a replication mistake occurs in the formation of a germline cell (e.g., in gametes), the DNA alteration may be transmitted to that individual’s offspring . 22. Where can RNA be found within cells? In the nucleus of eukaryotic cells, RNA can be found in the nuclear fluid along with DNA, and is also the main component of the nucleolus. In the cytosol (in eukaryotes or in bacteria), RNA molecules can be found on their own, as a structural component of ribosomes (organelles specialized in protein synthesis) or even bound to them during the protein-making process. Mitochondria and chloroplasts also have their own DNA and RNA. 23. Do RNA molecules have two polynucleotide chains like DNA? Only DNA has two polynucleotide chains. RNA contains only one polynucleotide chain. 24. What is the production of RNA called and what enzyme catalyzes this process? The making of RNA from information contained in DNA is called transcription. The enzyme that catalyzes this process is RNA polymerase. 25. What are the similarities and the differences between the transcription process and the replication processes? A DNA polynucleotide chain serves as a template in replication (DNA duplication) as well as in transcription (RNA formation). In both processes, the pairing of the two polynucleotide chains of the original DNA molecule is broken by the cutting of hydrogen bonds so that chains can be exposed as templates. The reaction is catalyzed by specific enzymes in both transcription and in replication. In replication, the enzyme DNA polymerase catalyzes the formation of a new polynucleotide chain by using free nucleotides in the solution and inserting them into the new chain depending on the DNA template exposed and following the rule A-T, C-G. In transcription, the enzyme RNA polymerase makes a new polynucleotide chain depending on the DNA template exposed, and obeying the rule A-U, C-G. In replication, the original template DNA chain is bound to the newly formed DNA chain via hydrogen bonds and a new DNA molecule is then created. In transcription, the bond between the template DNA chain and the newly formed RNA comes undone and RNA composed of only one polynucleotide chain is released. 26. What are the three main types of RNA? What is heterogeneous RNA? The three main types of RNA are: messenger RNA, or mRNA; transfer RNA, or tRNA; and ribosomal RNA, or rRNA. The newly formed RNA molecule, a precursor to mRNA, is called heterogeneous RNA (hnRNA). Heterogeneous RNA contains areas called introns and exons. hnRNA is processed in many chemical steps, introns are removed and mRNA is created, formed only of exons, the biologically active nucleotide sequences. 27. What is the difference between DNA and RNA with respect to their biological function? DNA is the source of information for RNA production (transcription) and therefore for protein synthesis. DNA is still the basis of heredity, due to its replication capability. Messenger RNA is the template for protein synthesis (translation). In this process, tRNA and rRNA are also involved, since the first carries amino acids used in the formation of the polypeptide chain and the second is a structural component of ribosomes (the organelles where proteins are made). 28. Is there any situation in which DNA is made based on an RNA template? Which is the enzyme involved? The process in which DNA is synthesized by using an RNA chain as a template is called reverse transcription. In cells infected by retroviruses (RNA viruses, like the AIDS or SARS viruses), reverse transcription occurs and DNA is made from information contained in viral RNA. Viral RNA within the host cell produces DNA with the help of an enzyme called reverse transcriptase. Based on that DNA, the host cell then makes viral proteins, new viruses are assembled and viral replication occurs. 29. Do the phosphate and the pentose groups give homogeneity or heterogeneity to nucleic acid chains? What about the nitrogenous groups? Based on this, which of those groups is likely to directly participate in highly diverse and heterogeneous genetic coding, or rather, which of those groups is the basis of the information for protein production? The phosphate and pentose groups are the same in every nucleotide that composes a nucleic acid. As result, they are the reason for the homogeneity of the molecule. However, nitrogenous bases can vary between adenine, thymine, cytosine and guanine (in DNA) and uracil (in RNA). These variations are the reason for the heterogeneity of the nucleic acid molecule. Homogeneous portions of a molecule seldom store any information, for the same reason that a sequence of the same letter of the alphabet cannot make many words with different meanings. The nitrogenous bases, on the other hand, because they are different (four different types for RNA or DNA), can make the different sequences and combinations that allow for the diversity of the genetic code. Study the next subject: go to Cell Structure.